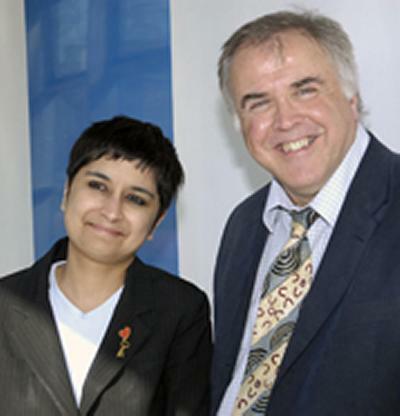 Prominent civil rights campaigner Shami Chakrabarti fielded tough questions about human rights, the Government's controversial plans for 42 day detention without trial and religious tolerance from 250 students and staff at the University of Southampton. The Director of Liberty later said she was impressed with the quality of debate at the event organised by the Centre for Citizenship and Democracy (CCD) at the School of Social Sciences. Professor Gerry Stoker, who leads the Centre, chaired the conversation which attracted students from several disciplines. CCD academics Professor David Owen and Dr Derek McGhee also contributed to the conversation. Ms Chakrabarti said: "Human rights can't just live in the courtroom, they need to be discussed in the classroom, the newsroom and the living room." She went on to warn: "Elections alone are not sufficient for democracy to survive; the elected majority may just close down the opposition as happens in many parts of the world." Professor Stoker said: "Shami covered a lot of ground in 90 minutes and spoke fluently and with passion on many subjects. It was an invaluable opportunity to discuss important issues with one of the country's leading campaigners." The Centre for Citizenship and Democracy supports teaching and research that explains, interprets and evaluates the challenges and opportunities that face citizenship and democratic politics in the modern world.